Sending lots and lots of white light………….know from experience that it helps…………. As another who knows the power of white light to find, in my case, my wayward pennant, 7 tealights lit on my recycled green candle holder from Spain to guide Julies feather talisman on its flight to you Mo. Setting a light in the window now. 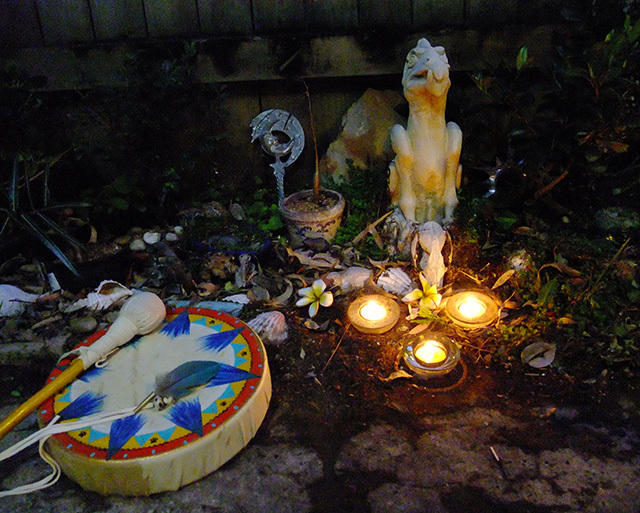 May the feather talisman land gently at your door in a timely fashion…. BEAMING with all my might. I am sure it will fly in like a homing pigeon, sending you light for the last one home. Have no doubts that the magic & light of all of these makings will guide it to you! The close one being far. It’s the ironic touch for the project. A meditation on space and expectation. Here’s wishing it arrives on time! I hope it sees the light !